Found this while metal detecting a field that I’ve dug a variety of aged stuff ranging from civil war breast plates and bullets to wheat pennies and buffalo nickels but this find has stomped me I’m hoping someone may have a clue what this came off off. Its a small clamp that when has the circumference close to a Morgan silver dollar. The name on it is Peter Macnab and is made mostly of silver. I’m hoping someone can ID this to come off an old musket or something. okay I’m pretty sure it’s not from a musket and missing a piece on the top side of the hinge. It’s also definitely to small to be from a pocket watch or something similar. Last edited by williammhatten; 04-15-2019 at 05:09 PM. Thanks! I’m also from Mississippi down here on the coast. Last edited by williammhatten; 04-16-2019 at 05:01 PM. is the Piece on top a hinge of some sort.. when I first saw it I was thinking maybe pocket watch bezel or something.. I have no idea but very cool find ! I will just guess that it might be a collar rim piece off a powder horn or flask. It's a collar/rim part off of something. Researching the name might be interesting. I did a cursory Google search on "Peter Macnab." Got a few hits. One is a writer, one an artist, and one took a somewhat famous snapshot of the Loch Ness Monster. Nothing found otherwise. 1+ on the powder horn rim. I definitely like them thoughts I don’t know why a powder horn would be in South Mississippi but you never know. Thanks it does appear to be a hinge not sure what it’s missing. MacNab is an unusual spelling of this surname. That might help. One Peter J. Macnab was 18 in the 1940 Census.Residing in Sherman Oregon. I like the idea of a flask hinge. Seems about the right size and makes sense to have a name on it. Thanks for the help guys y’all are awesome. Another decent possibility is the band/hinge to an inkwell lid. That looks pretty spot on to be honest. Thanks! Now if I could only make since of the holes in mine. I think you're in the ballpark between the inkwell or flask. The holes make me think it was affixed to something wooden or metal and not glass. 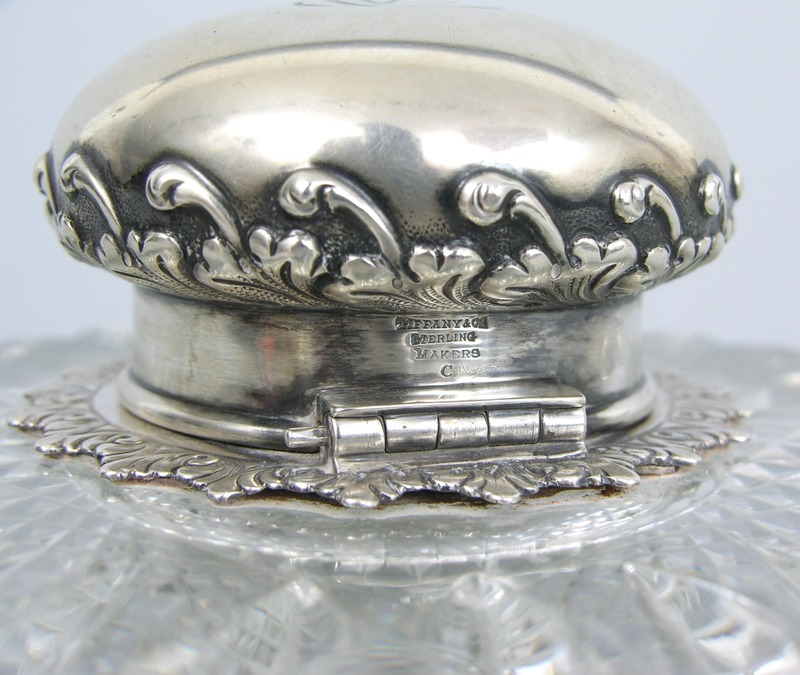 But the crystal inkwell was the best photo I could find of a similar band/hinge. I agree thanks for the help I’m gonn take a better look at it when I get back home tomorrow. But I think y’all have given me the best clues I’m gonna get. I wouldn’t be as interested in it if it wasn’t for the name engraved on it and the possibility of it being civil war related. Seems the Id's are getting closer. I would like to better close up photos of the 'hinge'. Okay I’ll try to get a better picture but I am using my phone so I’m not sure how good the quality will be. Will post soon. That’s the best I could get at the moment. Hope it helps I may be able to get a little bit better of a picture when I return home. Thanks for posting the hinge pics. The hinge does look very close to the one on the ink well. Size also seems correct for ink well. Back in those days ink wells were very common and were carried when traveling. They were required if one wanted to write. That’s a good possibility as well. Thanks!